Dunkin' offers their first two-filling donut with the introduction of the new Cookie Dough & Brownie Batter Double Filled Donut in time for Valentine's Day. Additionally, the chain brings back heart-shaped versions of some of their donuts as well as giving their frosted donuts new "Bling Sprinkles." 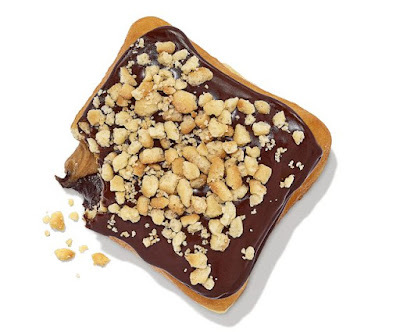 The new Cookie Dough & Brownie Double Filled Donut features a square yeast donut with double the regular amount of filling (in brownie batter-flavored buttercreme and cookie dough-flavored filling), finished with a layer of chocolate icing and crumbled pie topping. The heart-shaped donut selection includes Boston Kreme and Jelly, while the Bling Sprinkles Donuts include the following varieties: Chocolate Bling Frosted, Strawberry Bling Frosted, and Vanilla Bling Frosted. Finally, Dunkin' is running a promotion where you can get a 10-count box of Munchkins donut holes for $2 for the month of February 2019. Both the donuts and the Munchkin deal can be found at participating location nationwide for a limited time.